National Tiger Conservation Authority (NTCA): The National Tiger Conservation Authority was established in December 2005 following a of India for reorganized management of Project Tiger. and the many Tiger Reserves in India. Objectives: The NTCA addresses the ecological as well as administrative concerns for conserving tigers, by providing a statutory basis for protection of tiger reserves, apart from providing strengthened institutional mechanisms for the protection of ecologically sensitive areas and endangered species. The Authority also ensures enforcing of guidelines for tiger conservation and monitoring compliance of the same, apart from placement of motivated and trained officers having good track record as Field Directors of tiger reserves. It also facilitates capacity building of officers and staff posted in tiger reserves, apart from a time bound staff development plan. ⇒ In India, tiger census is carried out every four years. ⇒ Lastly, It was carried out in 2010 (before that in 2006). ⇒ The Tiger Census of 2010 in India puts estimated tiger population in the country at 1636 (lower limit – 1571, upper limit – 1875). The population estimate for Tiger Census 2006 was total 1411 (lower limit – 1165, upper limit – 1675). ⇒ Based on Enumerators Subjective Ability to Identify Individual Tigers from Pugmarks. ⇒ Not possible to obtain Pugmarks from all Tiger Occupied Landscapes. Counting of tigers in India is done in three phases. This method was created by the National Tiger Conservation Authority (NTCA) & Wildlife Institute of India, Dehradun & is being followed uniformly across the country. ⇒ Phase 2: (Habitat Characterization from satellite data) Statistical and satellite data were analyzed by the Wildlife Institute of India in collaboration with the National Tiger Conservation Authority. ⇒ Phase 3: (Computation of Tiger Density using Camera traps) The camera trapping procedure was conducted by research biologists. ⇒ Then through a mathematical model, statistical computation is done so as to check & balance all the errors in the three phases by comparing various figures obtained during the 3 phases. ⇒ Then by statistical computation, the ground survey data, Habitat Character Data & Relationship Equation (Tiger Density to Habitat Characters and Ground Survey) is computed together. This gives us the estimation of Tiger Population. The methodology is simple and robust and the estimation will be based on studies of systematically distributed sampling units or beats throughout the tiger landscape. b) Develop effective strategies to strengthen future tiger conservation programs. Why previous “pugmark counting” method was replaced with the current one ? Due to significant errors in the earlier pugmark counting method, its results are considered flawed, and cannot be compared with the results from this advanced procedure. ⇒ New findings of 2010 national tiger assessment suggest that most tiger source sites continue to maintain viable tiger populations. ⇒ Evidence of new areas populated by tigers has been found, e.g. Kuno - Palpur Wildlife Sanctuary and Shivpuri National Park in Madhya Pradesh. ⇒ Tiger has become a national symbol & hence India is in deep need to protect Tigers. ⇒ It is not just about money, but it is matter of keeping human intervention sufficiently at bay. India has many challenges to ensure that balance is maintained between development and environmental ecology. ⇒ It is a centrally sponsored scheme in force from 1973. ⇒ The main objective of Project Tiger is to ensure a viable population of tiger in India for scientific , economic , aesthetic , cultural and ecological values and to preserve for all time, areas of biological importance as a natural heritage for the benefit, education and enjoyment of the people. ⇒ Main objectives under the scheme include wildlife management, protection measures and site specific eco-development to reduce the dependency of local communities on tiger reserve resources. ⇒ Project Tiger has put the tiger on an assured course of recovery from the brink of extinction, and has resurrected the floral and faunal genetic diversity in some of our unique and endangered wilderness ecosystem. The population of tigers in the country has increased significantly to about 4000 from less than 2000 at the time of launch of the project. The effective protection and concerted conservation measures inside the reserves have brought about considerable intangible achievements also, viz. arresting erosion, enrichment of water regime thereby improving the water table and overall habitat resurrection. Labour intensive activities in tiger reserves have helped in poverty alleviation amongst the most backward sections, and their dependence on forests has also reduced. The project has been instrumental in mustering local support for conservation programme in general. 1. Elimination of all forms of human exploitation and disturbance from the core and rationalisation of such activities in the buffer. 2. Limitation of the habitat management to repair damage done by man. 3. Researching facts about habitat and wild animals and carefully monitoring changes in flora and fauna. ⇒ In 2008, it was revealed that India’s tiger population stood at just 1411. (5 years ago from 2008 it was nearly 3600). ⇒ There was a sharp fall in the number of tigers. ⇒ Government’s view: Counting methods of tigers has improved these days. The previous methods like pug mark were error prone & hence counted the number of tigers in a wrong way. 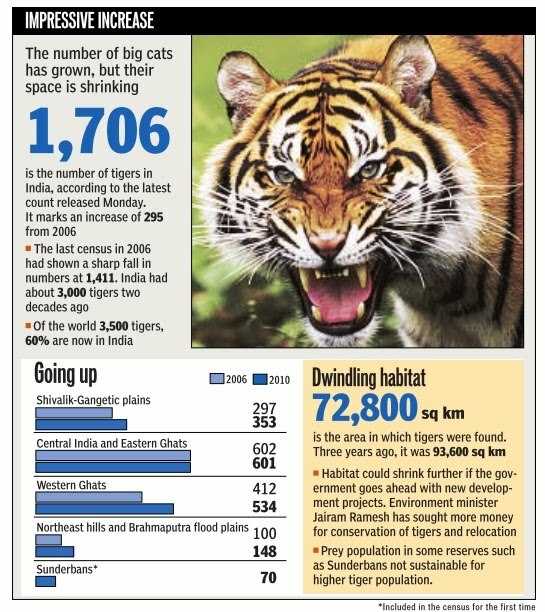 The current figures doesn’t show the decrease in the number of tigers but are actually showing the correct figures of tigers which were over exaggerated by the previous error prone methods. ⇒ Environmental activist: the government may have overestimated the number of tigers in 2003, but that the falling numbers were still shocking. ⇒ Late release of Central Assistance from states to the Reserves, inability of some states to provide matching grants. ⇒ The Buffer Zones: dual control by park and territorial divisions, encroachment, livestock grazing, fires, poaching of ungulates and birds. ⇒ Reduced Manpower: ban on recruitment resulting in vacancies and increasing average age of staff. ⇒ Equipment and vehicles: aging vehicles and inadequate logistics. ⇒ Basic amenities for field staff not adequate such as sustaining interior camps, medical care, mobility and non payment of project allowance. ⇒ The loss of connectivity and fragmentation in areas surrounding tiger reserves. ⇒ Tourism has turned out to be a bane for tigers. ⇒ There has been uncontrolled growth of tourists in the tiger reserves. ⇒ Ecotourism can be a possible solution to the tourist problem in these area. It will also generate livelihood options for the local people. The Wild Life (Protection) Amendment Act, 2006 has come into force on 4 September 2006. The Act provides for creating the National Tiger Conservation Authority and the Tiger and Other Endangered Species Crime Control Bureau (Wildlife Crime Control Bureau). ⇒ Ecotourism is a form of tourism involving visiting fragile, pristine, and relatively undisturbed natural areas, intended as a low-impact and often small scale alternative to standard commercial (mass) tourism. ⇒ The International Ecotourism Society (TIES) defines ecotourism as "Responsible travel to natural areas that conserves the environment and improves the well-being of local people." ⇒ Its purpose may be to educate the traveler, to provide funds for ecological conservation, to directly benefit the economic development and political empowerment of local communities, or to foster respect for different cultures and for human rights. ⇒ Responsible ecotourism programs include those that minimize the negative aspects of conventional tourism on the environment and enhance the cultural integrity of local people. Therefore, in addition to evaluating environmental and cultural factors, an integral part of ecotourism is the promotion of recycling, energy efficiency, water conservation, and creation of economic opportunities for local communities. For these reasons, ecotourism often appeals to advocates of environmental and social responsibility. Local People: Most forms of ecotourism are owned by foreign investors and corporations that provide few benefits to local communities. Definition: In the continuum of tourism activities that stretch from conventional tourism to ecotourism proper, there has been a lot of contention to the limit at which biodiversity preservation, local socialeconomic benefits, and environmental impact can be considered "ecotourism". For this reason, environmentalists, special interest groups, and governments define ecotourism differently. Negative Impact: Most of the ecotourism are not meeting the standards. Direct Environmental Impacts: Ecotourism operations occasionally fail to live up to conservation ideals. It is sometimes overlooked that ecotourism is a highly consumer-centered activity, and that environmental conservation is a means to further economic growth. ⇒ Man-animal conflict: Man-animal conflict is another major factor that affects the big cats. As humans move deeper into the territory of tigers, chances of conflict between both sides increase many fold. Men and livestock often become the victim of tiger attacks. This infuriates villagers who resort to revenge killing. ⇒ Lure for money or conservation: Funds amounting to millions of dollars are being pumped in the field of Tiger conservation. This has caused mushrooming of NGOs and conservationists who claim to be the biggest fighters for conservation. These organizations often struggle among themselves to get a bigger piece of tiger conservation pie. They most often work at cross purposes. There are some heads of the NGOs who even have their business interests, like forest lodges and hotels near tiger reserves. In such a scenario how anyone can trust these NGOs. Continued disappearance of tigers seems to indicate that none of them have been very effective in doing what is expected of them. ⇒ In the wild, tigers are found in India, Nepal, China, Russia, Bhutan, Myanmar, Cambodia, Laos, Vietnam, Thailand, Sumatra (Indonesia) and Malaysia. ⇒ Eight sub-species of tiger existed in the past out of which three have been extinct for many years. 5. South China Tiger (Panthera tigris amoyensis) found in China. The population found in Peninsular Malaysia has been given a status of separate sub species Panthera tigris jacksoni. 3. the Caspian Tiger (Panthera tigris virgata) that was found in Iran, Iraq, Afghanistan, Turkey, Mongolia, Kazakhstan, Caucasus, Tajikistan, Turkmenistan and Uzbekistan.